My Specialty Ailments Finding a right acupuncturist is a solution if you or one of your family members have to live in the assisted living or nursing home because your doctor told you that the disease you are suffering is incurable/chronic, such as Dementia or Alzheimer’s Disease, Disabling Stroke, Peripheral Facial Paralysis, Fibromyalgia, Hearing Loss, Osteoarthritis (hip, knee, shoulder), Parkinson disease, Restless Leg Syndrome, Rhinitis, Sinusitis, & Tinnitus…, or worry about the side effects of the prescribed medication/ a scheduled surgery. Comparing to the modern therapies (including medications & surgery), most of my patients have found themselves acquiring a better, curative results with only 10% -- 25% charge of modern therapies. To learn more simply read my client’s testimonial to both gain a better understanding of and whether their symptoms before acupuncture match your experiences. You can have a better option and continue your normal life style rather than a dependent one. What would you like? 1. Locomotors System: Usually, modern therapies such as medication, surgery … are not a good solution for arthritis, pain management & limb numbness. Many patients visit me after their surgeries for bunion pain, wrist pain, finger/toe numbness & pain, foot pain, knee pain, and shoulder pain. At last, they are pain free and range of motion are 100% with my practice. Some of them wrote their experiences through their Testimonials. 4. Neural and Mental System: My intuitive practice helps people receive total relief from a wide range of symptoms of Anxiety disorder, such as: shortness of breath, heart palpations, trouble sleeping, nausea, loss of appetite, pins and needles feeling from head to toes, nervousness, night sweats, tingling that felt like a cell phone vibration was going through out body, chest pain, headaches…etc. Insurance: I am an Anthem BC & BS provider, PPO, POS, HMO. Please always check with your insurance provider for coverage prior to your appointment with me. "An MRI found a full thickness tear in the rotator cuff as well as tendinosis and degenerative arthritis in my left shoulder. In addition there was a partial tear of the biceps tendon. This obviously caused pain & discomfort throughout the day and especially at night. I wanted to avoid shoulder surgery since it is not always successful and I did not want to be out of commission for two or three months since I enjoy golfing & yardwork. Dr. Liu’s regular acupuncture sessions since the end of April have produced steady relief of the pain & discomfort & my range of motion is almost back to normal. Another bonus of seeing Dr. Liu instead of surgery is that during these past 12 weeks I have remained active doing the yardwork & golfing that I enjoy. In fact, my partner & I came in first place in our local golf tournament during this treatment. "I have had allergy problems with my sinuses for a very long time (10 plus years). These problems got worse when I moved to the east coast and the pollen counts increased. My sinuses get blocked (especially my right sinus), and I get "allergy shiners" under my eyes. I also have problems with sinus headaches. With two treatments from Dr Liu my symptoms noticibly improved. While the needles were in place I could actually feel mucus beginning to drain out of my face and I could breath more easily. I intend to keep getting acupuncture for my allergies. Moreover, I have found acupuncture to be an excellent way to help with stress reduction and general well being. I always feel very relaxed and calm after a treatment." I went to consult with Dr. Chunhui Liu about an issue I was having with my neck, which radiated down my arm. The sheath in my neck has narrowed and it was causing pain in my neck and numbness in my hand and fingers. After my first session, my pain was reduced from a pain level of 8/10 to a pain level of 2/10, and the numbness was also less. It was even reduced further the next day. I had been being treated by a chiropractor for months, and I was amazed at the difference one acupuncture session had on my range of motion and pain. I went for my second session and wanted to address years’ worth of allergy issues. My sinuses were painful, draining and my lungs were phlegm. Dr. Liu used acupuncture to ease my symptoms from a pain level of 6/10 to a level 2/10; I was able to breathe deeply with one session. For my third session, Dr Liu treated my sinus pressure and migraine headache. I came in with a level 4/10 headache, and within a few minutes my headache was gone, and sinus pressure was disappearing. I am looking forward in continuing treatment without antibiotics - any with him helping my body heal itself. I am very new to acupuncture, but I feel that it has already helped me! I was nervous about the process, but Dr. Liu explained that he used thin, disposable needles - and the process is really pain free. I am going to continue treatments with Dr. Liu and look forward to finally being out of pain. I highly recommend trying Dr. Liu - he is very professional and I feel he will help me change my life! Call for a consultation today to see what Dr. Liu can do to make your life more comfortable! "My name is Krystyna and I got the Mirena (which is an IUD birth control) on April 7, 2013. On, June 20, 2013, I noticed that I was having horrible anxiety for no reason and I thought it could be from the Mirena, so I removed the Mirena a week later. Only 20 % of women get the side effect of anxiety from the Mirena. I tried homeopathic medicine called Nerve Tonic and drank lots of chamomile tea for my anxiety and that did not help at all. So I made a doctors appointment on September 2, 2013 and explained my symptoms to the doctor and they told me I was having anxiety attacks and I should try going on Celexa and Ativan. The symptoms that I was having from my anxiety was shortness of breath, heart palpations, trouble sleeping, nausea, loss of appetite, pins and needles feeling that went from my head to my toes, nervousness, night sweats, tingling that felt like a cell phone vibration was going through out my body, chest pain, headaches and I was simply not able to relax on a daily basis. On, September 6, 2013, I started taking 5mg Ativan as needed and 10mg Celera daily. The medicine helped my symptoms decrease but I was still having the same symptoms. I could not deal with my anxiety any longer. I found an article online that acupuncture has helped women with their anxiety attacks. On, October 3, 2013, I went to see Mr. Liuchunhu, for an hour acupuncture treatment for my anxiety. When I left the appointment, I was calmer and was wondering if the anxiety would continue to decrease. As the day progressed, I felt more at ease and the tingling through out my body ceased. I started to feel like myself again. I did not have to take my Ativan that night and was able to sleep well. On October 4, 2013, I did not have shortness of breath, heart palpations, and pins and needles feeling, sweating and tingling through out my body. I was relieved that I finally found another treatment that could help me deal with my anxiety. On, October 5, 2013, I started to feel the anxiety come back. I had shortness of breath, pins and needles through out my body but it only lasted for about 20 minutes. Mr. Liuchunhu informed me that I would have to get about six more acupuncture treatments to help me with my anxiety. I personally feel that because of the acupuncture it has helped me with my anxiety symptoms and I am happy that I tried it. It is a great alternative then me having to take my 5mg Ativan. I am sensitive to medication and do not like the side effects of taking medicine. I now know that acupuncture is a great way to deal with anxiety. I made another appointment with Mr. Chunhui Liu on October 17, 2013 to have my second acupuncture session for my anxiety. It is October 24, 2013, and a week later, I have found that the acupuncture sessions have relieved my anxiety. The day I received my second acupuncture session I felt calmer that day. I still had some sweating, heart palpations and shortness of breath on October 17, 2013. My friend even noticed that I looked more relaxed that day. On October 18, 2013 I was anxious and had some shortness of breath but I didn’t have any tingling sensation through out my body or sweated. On October 19, 2013 I was feeling even better and was feeling like my old self again. I was able to go for a hike and spend the day outdoors on the beautiful fall day. I did not have shortness of breath, heart palpations, sweating, chest pains or tingling through out my body. The anxiety has made me feel exhausted so that was a good feeling that I was able to get my energy back. I had no appetite because of my anxiety and I am able to eat again since the two acupuncture treatments. On October 20th, 21 and 23, 2013 I felt pretty good I was anxious and had some shortness of breath through out those days but I was able to deal with just that symptom. Since, the two acupuncture treatments I stopped taking my Ativan because my anxiety symptoms are manageable. I was very pleased with Mr. Chunhui Liu acupuncture sessions and would recommend him to any one that would be interested in getting acupuncture treatments." "I had been suffering for about 3 years with pain in the thumb joints of both hands. I had been diagnosed with osteoarthritis in thumb joints due to years of over use, abuse and misuse of my hands. Traditional western medicine was not helpful in alleviating the pain. This discomfort was making it difficult for me to train in the various “art” that I love. I am 57 years old and practice T’ai Chi Ch’uan, Tui Shou, Lau Ch’uan Su, Wu Chun, sword form and Emei Qigong. The chronic pain was making it difficult for me to properly utilize my hands in these forms. I was having profound pain when training in Tui Shou which is a partnered type of sparring exercise. After just one acupuncture session with you, when I left the office I had a good range of motion in both thumbs and was pain free for the first time in 3 years. I am very pleased with the results and want to thank you for your wonderful skill and knowledge." "I was diagnosed with psoriatic arthritis a couple of years ago. I had had a real hard time getting around and doing the things that I want to do. I tried therapy that didn’t do much. Then I had to try some drugs that were even worst I was still very sore and unable to do the things that I most wanted to do. Then, I tried acupuncture with Dr. Chunhui Liu. After 4 treatment sessions, I feel much better. Now, I am on my 8th treatment. I am able to do much more I will be forever grateful for this chance. I am sure that I will be back if anything changes in the future but for now let it be known that it has done a lot to make my life better." "Thank you for the recent treatment I have received from you. My lower back pain has improved from 7/10 to 3 in 10 point scale, which is big improvement, considering that I have bulged disk. I was skeptical about acupuncture, but not anymore. The whole experience of the treatment was very pleasurable and I will definitely recommend my friends in need to your practice. I hope I will see you soon. Thank You." "My name is Kathy. I am 57 years old and due to heredity, physical activity and "bad" shoes in the 1980's, I suffer from bunions and arthritis in my feet. I don't want to take drugs, and am skeptical of surgery. I saw an ad through Groupon for acupuncture and decided to give it a try. After the first visit I noticed a lessening of the pain. I have had over 25 sessions with Dr. Chunhui Liu during the past year. On my right foot, I had a bunion by my big toe and a bunionette by my little toe and on left foot a bunion by big toe (2 bunions and 1 bunionette in total). The acupuncture was amazing in that my bunionette is completely gone. In addition, the larger bunion has gotten smaller, the pain has lessoned significantly, and the degree of flexibility has increased. On my left foot, the pain has lessoned, and the size of the bunion has reduced so it is barely noticeable. Originally I was going weekly, now I go every other week to manage the pain. Each time I go, Dr. Chunhui Liu asks me how my pain is. In the beginning, there was some type of pain all the time, and then it evolved to rarely being aware of it. I am still a little stiff in the morning, with slight pain for the first few steps. I wear comfortable shoes with good arch support, play golf, teach yoga, and can once again enjoy dancing!!! Acupuncture with Dr. Chunhui has helped me manage my pain, reduce my bunions so my feet look better, and have made me a happier person! All this without drugs or surgery!" "I came to Dr. Liu after suffering with chronic thumb pain (De Quervain syndrome “blackberry thumb”). I was unable to find any long term relief through weekly physical therapy sessions. Following a cortisone injection, I was pain free for almost 3 months. I was still wanting to find lasting relief without surgery, which was the recommended course of treatment by my orthopedic surgeon. After twelve 30-minute weekly sessions with Dr. Liu, I can now say that I’m pain free and range of motion is 100% improved." "Working 27 years in both Commercial and Residential construction industry took its toll on my body. On a suggestion from my wife after she read an article she suggested to try acupuncture. In general the pain I was experiencing was interfering with life’s activities we all take for granted. I began receiving alternant treatments from Dr. Liu for lower back pain and bilateral knee issues mainly my right knee which was diagnosed with medial collateral ligament tears that never seemed to heal. I will say I was in pain every day and very fatigued my next recourse would have been surgery. From the very first treatment with Dr. Liu I began to receive relief from the pain, gained mobility and what I felt as an increased integrity within the both knee joints while avoiding surgery without any downtime and major rehab. Alternating treatments and now for my lower back has improved tremendously. Through Dr. Liu intuitive acupuncture he found and addressed small surrounding areas within my lower back region that were contributing factors to my pain. After my sessions I not only gained relief from pain but the ability to function overall with less fatigue. The treatment protocols have been tremendous. Feeling well with increased range of movement I have been incorporating stretching to my daily routine. Receiving Dr. Liu acupuncture and feeling better, to date I am walking my dogs every day, more active, stretching and now going to the gym. Another unexpected gain from the treatments has been a better sense of self, calmness and focus. I am now continuing maintenance treatments to manage stress and general maintenance. My wife has seen the biggest change. I would highly recommended Dr. Liu as his exceptional treatments offer an alternative to your overall health." "I would have been satisfied by Dr Liu relieving me of my back pain, improving my digestion, but he has gone beyond helping me in those specific ways. He has improved my general wellbeing. I didn't expect that. I feel markedly better overall. Also I was impressed by Dr. Liu's diagnostic skills during my first visit. He was able to find and disclose old injuries, to be able to see things within my body similar to a high-tech imaging machine. I am grateful he is practicing in our area." "Thank you very much for your acupuncture treatment. I was suffering with kidney stones for a week. Before the acupuncture session, I had back pain and kidney pain on a scale of 1 to 10 of 10, after the treatment it was only 2.5 on a scale of 1-10. After only one hour of your acupucture treatment I passed a very large stone. I had passed two small stones 2 days earlier with a lot of pain. I had my session early in the evening and the next morning, with no pain, I passed the largest of the 3 stones. I have since been pain and kidney stone free (I have attached a photo of the kidney stones)." "I have been seeing Dr. Liu for the last 3 sessions of acupuncture for my cycle irregularity and fertility purposes. I have always had issues of clotting, heavy periods at time, extreme fatigue, cramping and mid-cycle cramping, and cycles that can range from 31-54 days. I initially came to see him for fertility purposes since my husband and I would like to start a family, but Dr. Liu pointed out that we needed to regulate my cycle first with acupuncture sessions and then focus on fertility. Last month, I had issues of spotting for most of the month, this month I experienced no spotting, and little to no cramping. Dr. Liu also focused on my stress. I noticed that my basal body temp is becoming more like the ideal cycle in bbt charts and not all over the place. I usually have mid-cycle (ovulation) headaches that last for a couple of days and in this cycle, it only lasted a day. At the end of each session, I found my stress level has decreased and I become more and more relaxed to the point where I fall asleep from the session. I have yet to get pregnant, but I feel that I am heading to a right path and will do everything to avoid medications/treatments to get pregnant. Dr. Liu has informed me that by treating the body’s blocked energy, it will allow my body to become more fertile. This is my first time experiencing acupuncture treatment and I have become a firm believer of its holistic healing properties. I can honestly tell you that I can feel the healing vibration as Dr. Liu placed the needles on specific meridian points to work together as a team (as he explained to me). I am always eager to attend my sessions with Dr. Liu knowing that I am doing something very good to my body. And that is to balance and heal my body’s overall well-being." "You have treated me for my knees and right elbow in one session. I have felt really good after the session and it was giving very good relief to my aching knees and elbow. I am looking forward to take more another sessions to relive the pain completely as you have suggested. Thanks." "Since the end of January 2013 I have experiencing headaches on a daily basis. The pain was always in the same area, left side of the forehead, left temple and around the left eye. These headaches would come in all ranges of severity and length. On a scale from 1-10 they would average a 5, and could spike up to an 8 or 9. The start of these headaches can occur in the morning, sometimes in the evening, sometimes for 1 hour, sometimes for 6 hours. The only thing that could ease the pain was ibuprofen. I was taking 4 pills a day to lessen the duration of these headaches. After all the standard dexterity/brain tests, the neurologist said I had chronic headache and prescribed topomax. I decided on trying acupuncture before starting the topomax. Good thing I did. I met Dr. Liu on a Thursday for the first time. The first few needles were fine, but after the 7th I got a little dizzy. Dr Liu removed the needles shortly after that. The dizzeness subsided and I was able to go back to work within minutes. The headache started to disappear! Friday and Saturday, NO HEADACHE! That was the first time I had two days in a row headache free. On Sunday, a mild headache came back for only an hour or so. My second acupuncture treatment went very well. No dizziness at all, zero discomfort and nearly a week before a mild headache returned. I don’t know how acupuncture works, but I am becoming a believer!" Don’t give up on getting relief from pain! Almost a year ago in early July, I noticed the neck pain that had been bothering me for the previous few weeks had not gone away. I’d thought it was just a strain and would disappear after a while - no such luck. I went to the chiropractor several times over the next 4 weeks with no real help, getting an X-Ray and then an MRI, neither of which showed any cause. From there I was referred to an orthopedist for a cortisone injection which should have brought some quick relief. Again, no such luck - it didn’t even touch the pain. Then to another orthopedist who used a medial branch block injection to test for facet joint syndrome (which I do have in my lower back). Still no relief. Another session of several cortisone injections (nothing), and they decided more diagnostic information was needed in the form of a radionuclide bone scan. By this time, 7-8 months later, I was thinking this just might be with me forever - nothing could seem to help. But it’s so exhausting to fight pain all the time! While we waited on the bone scan results, a friend suggested acupuncture, my wife researched and found Dr. Liu (incidentally, both my wife and friend have Masters degrees in Public Health). I’d like to say the first treatment had magical results, but while it didn’t immediately make the pain go away, it was the first time there seemed to be any change at all. Dr. Liu was very encouraging and we kept at it, getting improvement each time. After 5 sessions, the pain was no longer constant and after a few more sessions, was down to perhaps 1-2 on a scale of 10. I am thrilled by the results Dr. Liu has been able to achieve, and continue to see him as we work toward eliminating the pain completely. Acupuncture, as practiced expertly by Dr. Liu, has provided me with much needed pain relief where Western-traditional methods failed - so don’t give up on getting relief from your pain! "I have had aches and pains in my neck for a year. After three months of chiropractic work, I made great progress at relieving the acute symptoms, and my physical well-being was at about a 70% to 80% level. Recently, I've again started to have symptoms of pain and instability in and around the cervical spine. I also suffered a sports-related injury that made my neck feel restricted and painful on the left side. The problem was mostly muscular and I thought acupuncture might just do the trick. After six sessions with Dr. Liu, I can honestly say he's the most thorough and dedicated acupuncturist that I've worked with so far. With a 15-year experience, he was realistic about my healing potential and honest about his own limitations. I felt cared for and am grateful for the results. The pain held in the deepest muscles has steadily released and I again felt more freedom and ease in my movements. I plan to continue working with him and I'm very hopeful that I'll soon feel like I have a young body, free from deep pain and stiffness." "Dr. Liu has treated me with acupuncture for a severe shoulder problem. I slipped on ice in the winter and suffered a severe shoulder injury. The pain was so bad that I was unable to drive with my injured arm. For several months I saw orthopedic doctors and physical therapists with no improvement. Finally I was referred to Dr. Liu. Within several sessions I recovered full use of my arm and shoulder. During the same session, Dr. Liu also treated a recurring migraine that had bothered me periodically (sometimes up to a week each month) for the past 14 years. Following each session I found dramatic relief from migraines and have minimized my reliance on mediation Dr. Liu is a man of integrity and is very skilled at his profession. Honest, honorable, thoughtful, sensitive and considerate. I have referred many people to him as he has helped me very much. I continue to see Dr. Liu for migraine headache relief." "I am a 67 years old retired RN and have been seeing Dr. Liu for the past several months. I have moderate / severe osteoarthritis, sinusitis, allergies and sciatica. Dr. Liu has been treating my shoulders, which I was told needed replacement of, but I try to avoid the surgery because my right shoulder had a surgery before. I don’t think the surgery could work. Now, after sessions of acupuncture with Dr. Liu, I have a better range of motion and decrease of pain with movement. From 1971 to 2011, I had more than 20 surgeries of polypectomies to try to get relief from my chronic sinus pressure. However, it still bothered me too much all times, although each the surgery could give me a relief for a few months. My sinuses are better and my hearing has improved greatly. My sciatic has gone and I am more mobile with less pain. I walk more upright / straighter with less back pain compared to that I used to walk in a bowing style for many years. All this has also improved my insomnia. I am so grateful for Dr. Liu's care and am amazed at the results of his 16 sessions of treatment. I would like continue to take treatment sessions with him to get my chronic conditions relief totally." "I came to Dr. Liu because of my stomach pains and stress. Before the treatment I had multiple pains and digestion issues like constipation and diarrhea. My doctor gave me the diagnosis of Irritable Bowel Syndrome. I was taking medication for it and it was not helping. After the treatment I started to see improvements in my stomach pains and stress levels lowered. I would recommend the treatment. Most of the pains have improved right after the first sessions. I have seen an improvement in my bowel movements and stomach pains associated with it." "Dear Chunhui Liu, I want to thank you again for treating my tinnitus with acupuncture, before I came to you I suffered from tinnitus for many years and with two treatments my ears are almost 100% fine with no ringing. Thank you again for your great care and I will be coming back to see you soon." "I came to Dr. Liu seeking help for vertigo. After several tests my primary told me I have a form of vertigo known as B.P.P.V. I am 79 years old and wasn't getting any relief from regular treatment. Dr. Liu agreed to work with me and I have seen a great improvement. I've had seven sessions and now have my balance back. No more dizziness, no anxiety, dry mouth, bitter taste and my sleep is more sound and longer lasting. So if there is something bothering you I'm sure Dr. Liu can help you too. Thank you Dr. Liu!" "Have you ever had so much pain that you try one thing after another, grasping for straws? I have for more than 40 years now. I have cervical dystonia; similar to Parkinson's - my neck and head shake ALL the time, uncontrollably. My daughter and my niece have the same symptoms; my Mom had Parkinson's. I currently use a toxic injection, through my neurologist, to paralyze my neck muscles every 3 months, but it is working less and less, and very, very costly. I have also been told I can have something put into my brain to stimulate my nerve endings, called Deep Brain Stimulation, (That's scary!). NOW here is the good news...after struggling for more than 40 years with this condition that only seems to get worse over time, I ﬁnally met Dr. Liu who introduced me to the world of Western Chinese medicine through acupuncture. Hope against all hope, I decided to give acupuncture a chance. It was the best thing I could have ever done. I won't paint an easy picture for you because it is, at ﬁrst, worrisome about all those acupuncture needles in your body but believe me, try it. Like me, when you are in pain every day of your life, what is the harm in trying this western medicine that has transcended over the years, from the beginnings of Chinese civilization, one of the oldest civilizations of the world. I am a testament to the fact that acupuncture really does work. The ﬁrst session was a disaster because I was too nervous. I was hurting more, so I called Dr Liu to cancel. He understood. BUT here is the miracle.....Dr. Liu chose to call ME back the next day after researching my condition more. He was so compassionate and caring, and convinced me that I should try again. He was so convincing to me that I should, based on his personal and caring demeanor. This morning, I woke up without shaking. I shake every single day--- as soon as I open my eyes. This time I did not. Today is a day I will remember for a life time, and it is all because of my strength to try again, and the miraculous intervention of Dr. Liu and his talents. Dr. Liu is very well known in China for acupuncture as well as his medical degree in cardiology. His wife works at Yale, so genius comes in the family. I cant wait to go back to see him, and to see his smile when I tell him it worked. He lights up just as much as I do knowing I have less pain. Dr. Liu explained to me that these needles are just like a team of soccer players---and he has to ﬁgure out the right players who all work together toward one speciﬁc goal. Then, SCORE!!! Thank you Dr Liu." Why Does Specialized Acupuncture Work? Like the nervous system and endocrine system, the meridian system regulates and controls functions of the human body. Balance healing is achieved when all three systems work together harmoniously. Stimulating the meridian system with the acupuncture optimizes the healing process. Traditional Chinese medicine has over 3000 years of recorded history and is proven to improve symptoms that are thought incurable with Western medicine. Why Come to My Clinic? The good solution is to find the right acupuncturist when you suffered from the chronic condition, because each acupuncturist is different. Among them, there is a different medical education background, different Western medical and/or traditional Chinese medical clinic performance, experiences and specialty. It is important whether they can understand your body’s need with his/her insight & intuitive clinic experience. Whether you will ever get rid of/the relief from the chronic condition is decided by the spot team (in which needles are inserted) your acupuncturist chose for your symptom. So, what you need is to learn simply read the testimonials from other patients to both gain a better understanding of and whether their chronic condition before acupuncture match your experiences. Dr. Chunhui Liu received his M.D. from Jiangxi Medical College in China and completed post-residency rotation in various branches of internal medicine including cardiology, endocrinology, gastroenterology, geriatrics, hematology, oncology, respiratory disease, and urology. Having served with distinction high-ranking government officials and their families in the province of Jiangxi for more than ten years, Dr. Liu had extensive experience and expertise in both Western medicine and the traditional Chinese medicine. 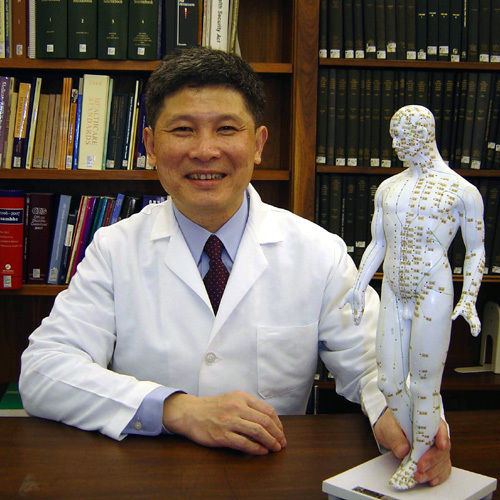 Now as a certified acupuncturist serving the greater Connecticut area, Dr. Liu's unique background allows him to treat patients by using the best consideration of Western medicine and traditional Chinese medicine such as acupuncture and herbal remedies. Dr. Chunhui Liu, M.D., L. Ac. Copyright © 2009 - 2019 sahmclinic.com. All Rights Reserved.